When I was a kid, my father showed me all the books and souvenirs about and from Japan, among it a few coins. So the 5 Yen Coin has a significant meaning for me personally, because it was the very first japanese coin I ever saw or held. But the 5 Yen coin actually holds a special place among the different coins of the japanese currency. 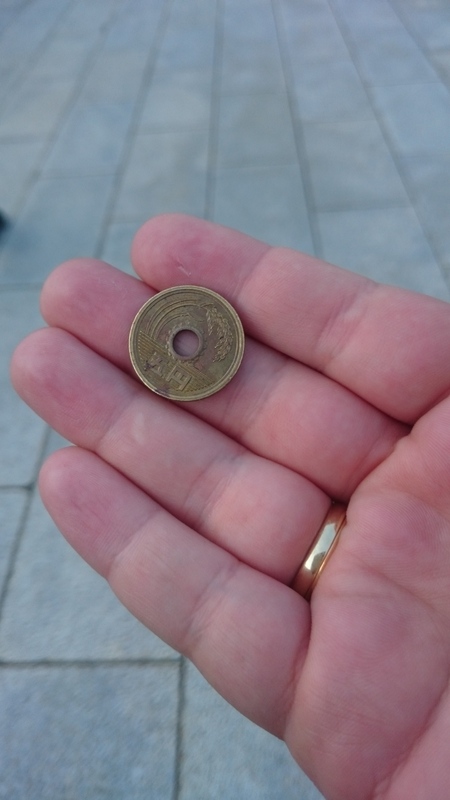 Though it is not the only coin with a hole in it (the 50 Yen coin does have one as well), it’s the only one without arabic numerals. The japanese word for 5 is “go” and the word Yen is pronounced “en”, which makes the pronunciation for 5 Yen “go-en”, a homophone to goen (御縁). 縁 – en means connection or relationship (sometime seven translated with “fate”), while 御 – go is the respectful prefix. Where would you want more to build a relationship, then when you are offering an Osaisen (お賽銭) – money you throw in the offering box before praying at a shrine. I remember my new year’s eve at the Meiji Shrine in Tokyo, where they had a huge area for all the people to throw their money, since it would have taken too long for everyone to go to the offering boxes individually. The ground was covered with 5 Yen and 50 Yen coins. Have you seen people throw five Yen coins or do so yourself?